This bridge was recently retrofitted with steel jackets around the columns and restrainers and shear keys at the bearings. 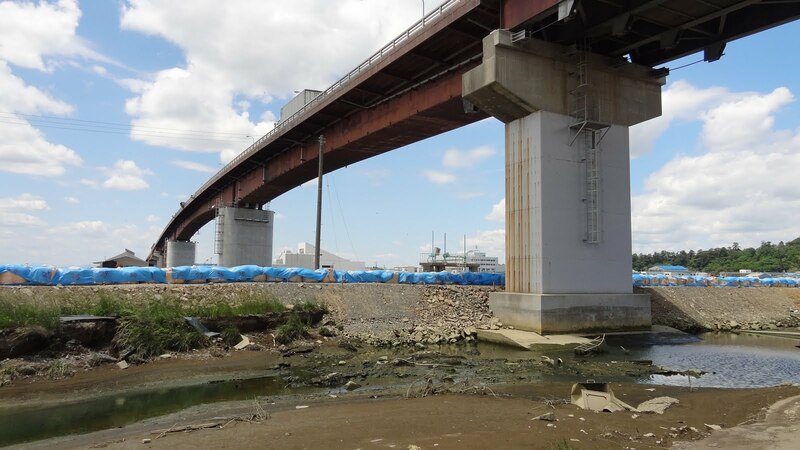 However, the superstructure is high enough to have avoided the tsunami rushing upstream after the earthquake. The one thing I'm uncertain about is the use of Corten (weathering) steel for the girders. I wonder if this type of steel performs as well and lasts as long as steel girders that are primed and periodically painted? Japan's Bridges: Hiyori Bridge across the Kitakami River in Ishinomaki (2) by Mark Yashinsky is licensed under a Creative Commons Attribution-NonCommercial-NoDerivs 3.0 Unported License. I think weathering steel is now quite well trusted, it's the default in preference to painted steel in many places. Recent reasons I have seen for not using it all relate to issues other than its basic durability: visual appearance; unavailability in rolled sections; difficulties removing graffiti etc.